Boss Femme is like the amalgamation of fresh floral women’s scents. It’s like Love Etc. in that it pretty much smells like a category of scents without too much to discern it from the rest. But in a way, that could also be where its success lies. In Bottle: Floral with a hint of fruit. I’m smelling a bit of rose but there’s a stronger jasmine note in this that’s vying for attention. This smells flowery, clean and feminine. Very generic but entirely enjoyable. Applied: Goes on with a light citrus and slightly tart opening as it spreads into the mid-stage with that pleasant, breezy rose and jasmine combination. There’s a faint hint of sweetness in this too to make it more feminine than it already is. I like this, it’s nice. It’s not great. It’s not groundbreaking. It’s just plain old nice. As Boss Femme heads into the dry down, you get a little bit of smoothness wandering in as it mixes with the lemon and for a brief moment, I thought I smelled plastic but the dry down is a predominantly sharp lemon, layered with a bit of smoothness and soft wood. Boss Femme is just good, clean, nice, and no nonsense. Kind of like soap–except better. Extra: I think I’ve said it before, that Hugo Boss seems to be really good at keeping their fragrances on the lowdown and less offensive side of things. And it works out okay for them. It’d be quite the day when this house puts out something so awesome it eclipses the sun. But for now we have nice things like Boss Femme and Deep Red. Design: Boss femme is an interesting little glass bottle that’s slanted at the top part with a cap that slants down to cover that portion up. It’s an interesting little design decision that makes my need for everything to be straight twitch just a little bit. The name of the fragrance is written in cursive font on the glass. The bottle I used had “femme” running along the dip of the curve and the house name etched into the metal sprayer. The bottle is easy to hold though, has a good weightiness to it and the color of the juice is just adorable. Notes: Tangerine, blackcurrant, freesia, jasmine, fleur de lys, Bulgarian rose, apricot, lemon, wood. There was a woman who worked briefly for a doctor I used to go to who wore this scent. I remember her rather well–not so much for her perfume–but for how the smallest things could make her laugh. 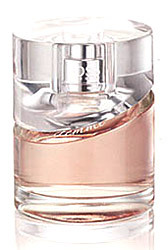 Reviewed in This Post: Boss Femme, 2008, Eau de Parfum. This entry was posted in floral, fresh, hugo boss, Reviews By House and tagged apricot, blackcurrant, Bulgarian rose, fleur de lys, freesia, jasmine, lemon, tangerine, wood. Bookmark the permalink.